Cartoon Network has detailed a new collaboration that pairs final year students of the London College of Fashion with the iconic The Powerpuff Girls IP. The studio is giving the student designers the chance to create a Powerpuff Girls inspired statement outfit for autumn/winter 2019 that will embody the brand’s message of female empowerment, while capturing the trends of the season. 15 groups of two to three undergraduates have already been selected from the college’s course to create a never before seen signature couture item. A shortlist of eight groups have now been chosen to have their garments manufactured and showcased at an event at Somerset House this Friday, February 15th. It will all be a part of London Fashion Week. An expert judging panel including Jessica Saunders; programme director for the Fashion Programme in the School of Design and Technology at London College of Fashion, UAL and Leila Loumi; international licensing director, softlines, health and beauty, Cartoon Network Enterprises; will chose a first, second and third place winner and will award cash prizes to be shared amongst each group. “The original ambassadors of girl power, The Powerpuff Girls continue to lead from the front and inspire young women with their unique brand of fearlessness, determination and positivity," said Cartoon Network’s Leila Loumi. 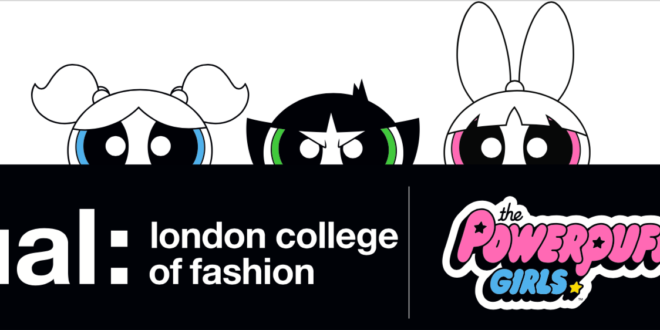 Cartoon Network’s collaboration with London College of Fashion is the latest in a raft of partnerships that has seen the iconic look of The Powerpuff Girls being adopted by global fashion designers. Recent partners include Moschino, Fyodor Golan, Katie Eary and Sabrina Pilewicz. Since their debut in 1998, Blossom, Bubbles and Buttercup have charmed girls and women of all ages as the original ambassadors of girl power, juggling school work, fighting bad guys, and always saving the world before bedtime. With an all-new, reimagined animated series produced by Cartoon Network Studios capturing audiences worldwide along with a trend-led licensing program, a new and diverse generation of fans continue to be inspired by The Powerpuff Girls.